Hard and seemingly without relationship to each other the three high and narrow parts of this triptych manifest themselves to us. Especially the panel in the middle catches our attention with its expressive colour palette. Warm brown and red tones suggest the body of a human figure, with only the head clearly recognizable. Forming rays, the colours run up and down out of the dark centre. They seem to create a shield and give the impression of the head gazing over this ‘wall of colour’ into the undefined distance. The two side panels form two abstract planes with a grey-blue and silver-white glow. In the thickly applied paint traces of gouging can be observed, in the form of slashes in the upper half, in the lower half in the shape of eyes. At first sight an inner connection between the middle panel and the side panels can hardly be perceived. But if we look closely, we can recognize a structure at the top that is slightly sloping up. Because of this, the figure is given wings. Does the figure portray an angel? A cherub as in Ezechiel 1:4-21 or - on the basis of its red colour - perhaps a seraph, that heavenly creature that is characterized by its burning nature, setting things on fire, often portrayed with many eyes in its body? However this may be, he emanates a kind of safety and protection. Between the cool colours of the two side panels he exudes an earthly warmth. As a colourful beam of light he appears before our eyes like a presence from another world that can be perceived by our senses, unapproachable and yet inspiring confidence. Living from his centre, he changes and integrates whatever is surrounding him, making it into his wings that lend him the beauty of a peacock flaunting its feathers. Of these eyes we have nothing to fear. They do not refer to the camera lenses of ‘Big Brother’ that record everything, but rather to a circumspect watchfulness and presence nourished from within. Whether he is a messenger from heaven or rather an image for ourselves – whatever he may be, he is totally there, filled with a warm and positive power that does good, by which we like to be set on fire. With his inner and outer, visible and invisible eyes he beholds his environment and thus acts with an eye for others, averting danger, at the right moment doing what is right. Patrik Scherrer is the driving force behind the German website Bildimpuls. Every fortnight he sends around a ‘Bildimpuls’or visual meditation, in which he focuses on contemporary Christian and religious art from Germany, Switzerland and Austria. He studied theology and works with the mentally handicapped. He wrote the book: Gott in Sicht? 33 Impulse zum christlichen Glauben aus der Pinakothek der Moderne. On the Bildimpuls website there is also a lot of information about artists, books, museums, exhibitions and organizations, see www.bildimpuls.de. Michail Schnittmann (b.1953) is a Jewish artist from Odessa (Ukraine), who lives and works in Berlin. Website: www.michail-schnittmann.de. 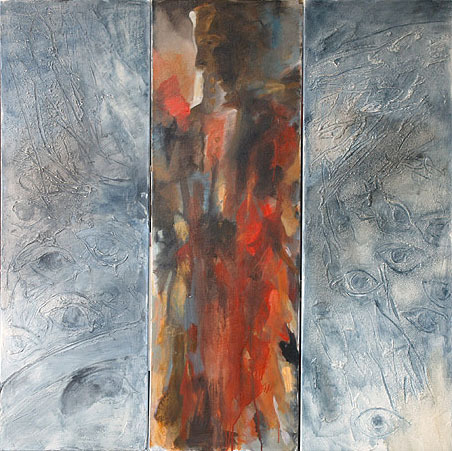 Michail Schnittmann: Wings, 2008, triptych, 120 x 120 cm. Middle panel oil paint, side panels acryl, sand and oil.